The joinery saws pictured in Smith’s Key are very similar to back saws still being made today. § 50. The Tenon Saw, Pl. 13. Fig. 7. Is generally used for cutting wood transverse to the fibres, as the shoulders of tenons. The plate of a tenon saw is from fourteen to nineteen inches in length, and the number of teeth in an inch from eight to ten. As this saw is not intended to cut through the wood its whole breadth, and as the plate would be too thin to make a straight kerf, or to keep it from buckling, there is a thick piece of iron fixed upon the other edge for this purpose, called the back. The opening through the handle for the fingers of this and the foregoing saws is inclosed all round; and on this account is called a double handle. § 51. The Sash Saw, Pl. 13. Fig. 8. Is used by sash makers in forming the tenons of sashes: the plate is eleven inches in length. The inch contains about thirteen teeth; this saw is sometimes backed with iron, but more frequently with brass. Is used in dove-tailing drawers. The length of the plate is about nine inches, and the inch contains about fifteen teeth. This plate is also backed with brass. The handles of the two last saws are only single. 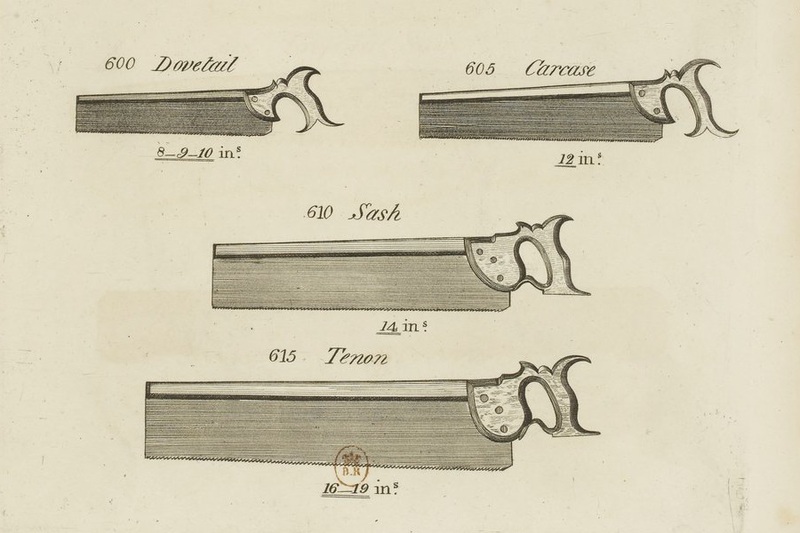 Nicholson describes three backed saws here; The Tenon Saw, The Sash Saw, and The Dove-tail Saw. The Tenon Saw is described as a long backed saw (14-19″ long) with 8 to 10 TPI. Nothing special about that, except that he notes that the tenon saw is generally used for crosscutting tasks like cutting the tenon shoulders, not for cutting the cheeks as we often think about when talking tenon saws today, which is a ripping cut. Interestingly, he makes no mention of sawing the cheeks in the section on saws. However, in the section on framing two pieces together using the mortise and tenon, he describes sawing off the cheeks of the tenon with the hand saw, a 26″ long unbacked saw (discussed in the last article). I have actually tried this, and it is surprisingly easy and efficient. Joseph Smith also pictures a 14″ closed handled saw that he refers to as a Sash Saw. The name of this saw may be unfamiliar to a lot of folks as the nomenclature fell out of use a long time ago. Nicholson’s sash saw is a bit different than the one pictured by Mr. Smith, as we’ll discuss in a moment. But note that in Nicholson’s description of the Tenon Saw, he says that the saw is from 14 to 19 inches long. So what Mr. Smith calls a Sash Saw is still considered a Tenon Saw by Nicholson. No wonder these things are so confusing today. They didn’t even agree on the names 200 years ago. Smith calls it a sash saw. Nicholson calls it a tenon saw. 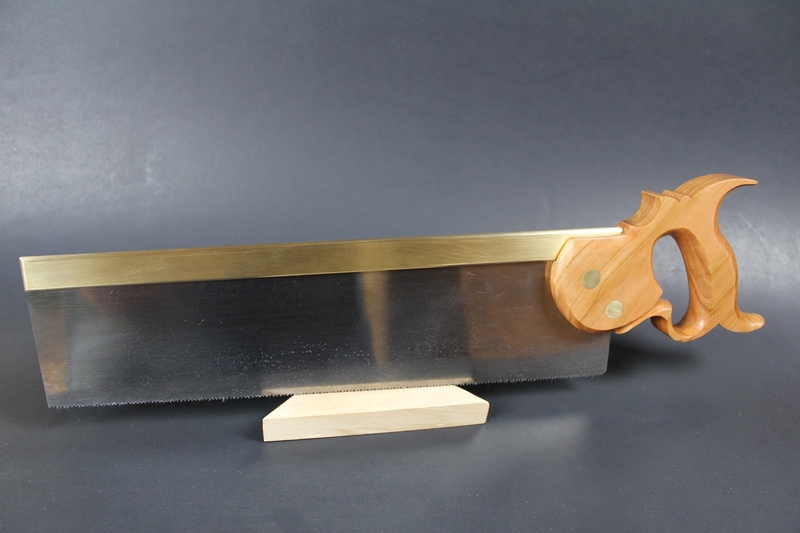 Regardless of what you call it, a 14″ brass or iron backed saw with about 13 points per inch is very useful for furniture sized joinery work at the bench. The next backed saw that Nicholson describes is his version of the Sash Saw. Interestingly, what Nicholson describes as a Sash Saw is what many woodworkers today, and indeed Joseph Smith as well, would recognize as what we often refer to as a carcass saw. This is a relatively short (11 to 12 inches) open handled saw with about 13 TPI, used for cutting small tenons and making small crosscuts. The last backed saw Nicholson talks about is The Dove-tail Saw, which I’m guessing just about everyone is familiar with. The saw is about 9″ long with 15 TPI and is designed for cutting the dovetails in thin (3/4″ thick and less) stock. This saw would be easily recognized today. Like the long saws, the joinery saws were designed and tuned for specific tasks. But our discussion of saws doesn’t quite end there. Not all hand saws are designed for cutting straight lines. Posted in Hand Saws, Tools and tagged carcase saw, carcass saw, dovetail saw, sash saw, tenon saw.